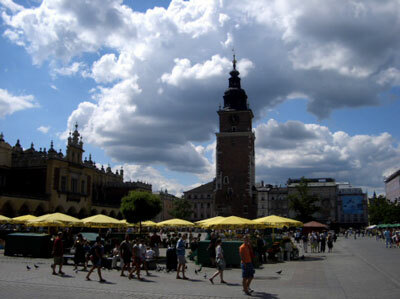 Krakow is a vibrant city. The streets are busy with people rushing everywhere. The shops seemed to be very busy, especially in Kazimierz (the old Jewish section of Krakow). There are many tourists. They are coming in by the bus loads. Around Sukienice, the city square, there are shops, food concessions, restaurants and the countless sidewalk café where you have waiting lists to be seated at all hours of the day and night. At midnight we took a buggy ride around the center of town, all around the Wavel—we just simply ran out of time, so we skipped the Wavel (the castle). We walked back around midnight to our hotel rooms, pretty exhausted but very satisfied of what we have seen, done and accomplished thus far. The next day Andre’, our driver took us to Auschwitz and Birkenau. While on route there it stirred up feelings in me which I cannot describe in words, emotions which I did not know were still confined in me. Suddenly I saw images of the past which were etched deep into my memory. Visions of black uniforms, swastikas , sirens, Gestapo, SS, shinny black boots, dogs, pistols, rifles, screams, shouts, whips, reflections of fire, smoke vivid memories of the ashes of Birkenau, selections, mountains of corpses all around me, children savagely torn from their mothers, furnaces, fire pits, frighten faces, hunger, starvation, gas chambers, barbwire, Kapo’s, shovels, picks, and sledge hammers, freezing cold, standing in appels, dying faces, bulging eyes, death march, cattle cars, bunkers, attics, beatings, lice, vermin, latrines. My heart is pounding and I closed my eyes, trying to steer my thoughts away from the past back to the present, but without success. Now my head is spinning and I hear loud speakers yelling—JUDEN RAUS, ACHTUNG! LOS LOS, RAUS SCHNELL! The KAPOS yelling ZUM APPEL PLAC! DIE MUTZE ABNEHMEN! DER COMMANDANT YELLING DU VERFLUCHTE JUDEN? SCHWEINHUNT, etc. etc. If you don’t know the meaning of any those aforementioned words, consider yourselves lucky. I see the gallows and I hear the cries of SHEMAH YISRAEL ADONAY ELOKENU ADANAY ECHOD, the last prayer before death (hear, O Israel; the eternal is our G-D, the eternal is one.) It seems like the closer we got, the more vivid those flashbacks became. When we finally arrived and I saw those tracks which led 1.5 million men, women and children to the slaughter houses of Birkenau. Even though I was in Birkenau during the war in 1943 and this is going to be my second visit to Auschwitz after liberation and I knew what to expect, my stomach was in knots. As I revisited those exhibits, the anger started to engulf me. I started feeling that my whole body is being consumed with anger of how this master race has mastered to perfect the science of torture and mass murder and how they were able to industrialize and profit by creating numerous death factories. They were proud of the fact that they have developed a method where they can now gas to death up to 2000 people in each facility in 20 minutes time. What an achievement that must have been for these cultured people of the Third Reich. I was engulfed with anger when I saw the mountains of human hair that were collected to ship to Germany to produce textile, the photos of the gold teeth which they extracted from the dead bodies, all the used clothing sent to be recycled, shoes, baby shoes, children shoes, women shoes and men’s shoes. Eyeglasses, valises and all of those items once belonged to a living human being. How were they able to keep doing this to millions of people and the world was silent? While in Auschwitz I gained tremendous respect for my son-in-law Michael Gerber, when I saw him get out of his wheel chair and pull himself up the many flights of stairwells with all his strength in his body, just so that he should not miss the many exhibits which were mostly either in the basement or on the second floor. When I asked him to take it easy, his reply was, "when I hear about the torture, starvation, afflicted pain and finally the death that those poor souls had to endure, how can I not make every effort in order to honor their memory".